Magic? Yes perhaps there is a pinch of magic: a piece of furniture that opens, a sofa disappears revealing a wall with shelves, containers, LED lights and a comfortable bed. All with a simple movement, no effort and a lot of style. Thanks also to SCM Group’s technological solutions. “Well without technology we wouldn’t be able to do almost anything: it is a determining aspect for our company. It allows us to create our collections, it affects our way of thinking the product, it allows us to reach the objectives that we have set ourselves… Without constant investments in technology, from the moment my father setup this company in the seventies, we certainly wouldn’t be where we are today”. Claudio Santinato, co-owner with his sister Barbara of SANDI MOBILI of Bovisio Masciago in the province of Monza and Brianza, surprises us. He knows full well that we are here to see an SCM group work centre, the Morbidelli Planet P800 in action and he sums up the situation in a few words. Without technology certain passages would not have been possible and Sandi Mobili might not have grown to its present size or it might still be constructing upholstery frames for classic living rooms. This is how the company began in the early seventies, when Luigino Santinato (father and founder of the company) decided to stop working as help in a local kitchen and starting making upholstery frames. Today the Santinato family can count on internal and external collaborators. 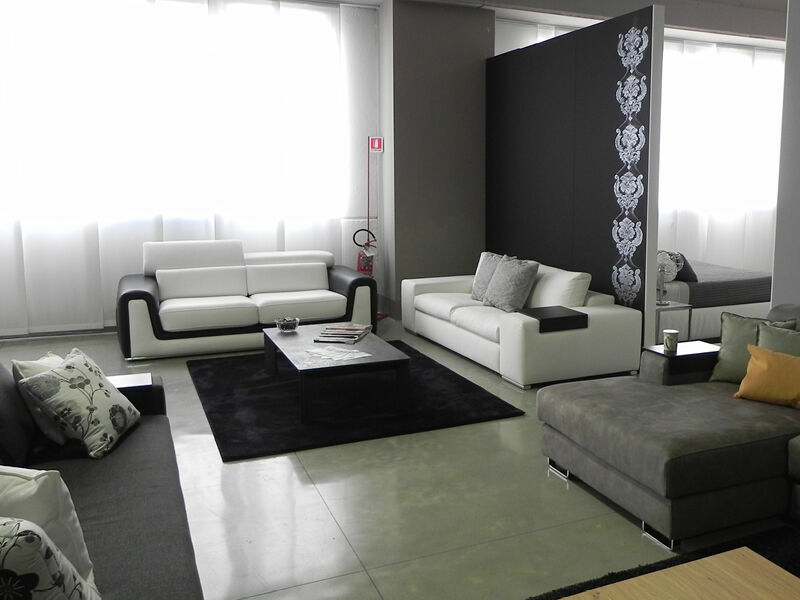 An 800 square metre showroom and 1600 square metre production space, reflect the choice of investing heavily on technologies that allow them to be small, flexible but still be able to guarantee customers quality, aesthetics and performance, whether final consumers, retailers or furniture makers for whom they work as subcontractors. “When my sister Barbara before me and then I afterwards, started working in the family business – explains Claudio Santinato smiling – we understood that the time had come to change direction. We had to move on to working with panels, whilst still continuing being true joiners, capable of producing numerous different things. At Sandi Mobile we are certainly not afraid of change: we continue producing upholstery frames and, by collaborating with other companies, we started producing finished pieces. We also make furniture. Anything they ask us for we are ready. Whether it is a family looking for a living room, a furniture maker looking for a quality subcontractor, a retailer wanting to broaden their portfolio, which today is 90% of our business”. Until a few years ago, when the Santinato siblings, in a difficult market situation, came up with the Soluzioni Salvaspazio (Space saving Solutions). The name is self-explanatory, they devised a solution to enhance and multiply living spaces. Single beds, double beds, bunk beds: customers just need to explain what they need and the Santinatos find the right solution. These are a far cry from the lacklustre and uncomfortable beds that we have all had the misfortune of trying at least once in our lives, in temporary situations. When Sandi Mobili decided to create the “O’CLACK SOLUZIONE SALVASPAZIO” collection, they decided to do things right. Space saving furniture that didn’t have anything in common with a domestic campsite. Therefore well-designed and constructed furniture with quality finishes and trendy colours and when the bed is opened everything appears and disappears. Fitted walls, shelves, LED lights, padded headboards, containers for cushions, sofas that disappear without having to stack or move everything in a corner of the room. All, obviously, rigorously made in Italy. Thanks to a mechanical solution that is well-designed, patented, tested by test labs (Catas) and constructed by trustworthy suppliers, living spaces are transformed, they change their use in an ordered, comfortable, practical and pleasant way. “We worked for over two years on this project”, explains Claudio Santinato. “Houses are increasingly smaller and there is a real need of managing spaces in the most intelligent way possible. We worked on this for a long time, but now the “O’CLACK” collection is a continuously evolving range. With a simple movement day becomes night: this is our challenge and our philosophy. Many come to us to resolve problems of space and we put all our experience and skills at their disposal: in a maximum of six weeks the problem is resolved. A quality product, a continuous innovation both in terms of functionality and aesthetics which uses melamine or lacquered panels, with thick Abs edges. “The edgebanding is an important aspect of a piece of furniture. It improves the aesthetics of the finished piece as well as protecting the edges. 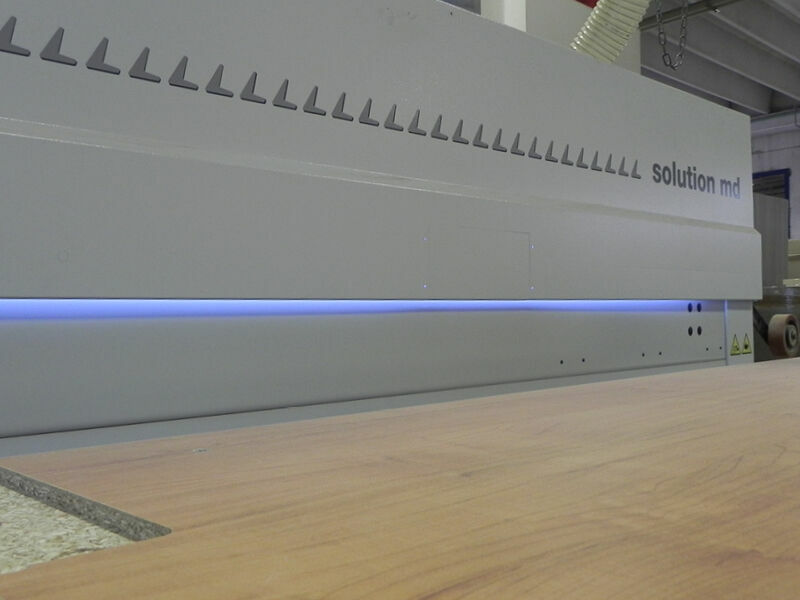 In recent months we have been working with a STEFANI “SOLUTION MD” edgebander that we can use with EVA, polyurethane glue or hot air. The latter is a solution that allows us to further increase our appeal, with a very minimal strip of glue. A heavily automated process that achieves results that frankly we would never have imagined,”, says Santinato. “We can make panels with an excellent finish: they seem lacquered”. “Whatever we do, our way of working is through consolidated collaborations”, continues Claudio Santinato. “Also in terms of technologies: we have always worked with SCM Group. Together we look at what they can offer, to understand what we could do to improve it further, together. Without technology we wouldn’t be in the running and for us having a reference partner was fundamental. On the other hand today you can produce any piece of furniture with three machines: panel saw, edgebander and a work centre. Today it’s difficult to find good joiners, without considering the speed at which tastes and materials change. If you cannot adapt quickly and if you are not ready to change your habits you run the risk of falling by the wayside. For just over a year we have been working with an extremely powerful work centre, the Morbidelli Planet P800, which we use for drilling and routing, as well as edgebanding all curved or complex profiles. 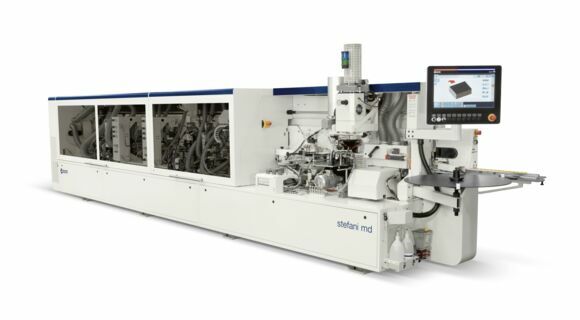 Working with the SCM group means being able to count on an integrated system of machines that can communicate with each other without hesitations. Most importantly it means that we can exchange impressions on the machines in order to implement the best solution possible. I think that I can safely say that we built our Planet together, in order to reach the absolutely optimal level. We do everything with the Morbidelli Planet P800: squaring, edgebanding, drilling, routing with five axes. A compact woodworking workshop in a single machine, automatic tables also for two panels at the same time, compact heads, presser rollers that can be quickly changed to achieve any edgebanding finish, working with plastic or wooden edges, with a minimum radius up to 15 millimetres or 45° profiles. This machine allows us to think of new opportunities every day”. “Just to give you an example: the work that you can see in the machine was made last year by one of our competitors. This year we can do it too, thanks to a larger roller that allows us to apply a difficult aluminium edge perfectly and without any ondulations. We can be more competitive and not lose any orders”. “A considerable part of our production passes through this Morbidelli Planet: it’s a fast machine that is not so far from the idea of an automatic factory, even though the human supervision and intervention is always needed”, concludes Santinato. At Sandi Mobili they have their gaze firmly set on the future: an “O’Clack Easy” line that includes space saving beds with guaranteed performance but at even lower prices, for those needing temporary solutions or for second homes, that could even be sold in kits, online.